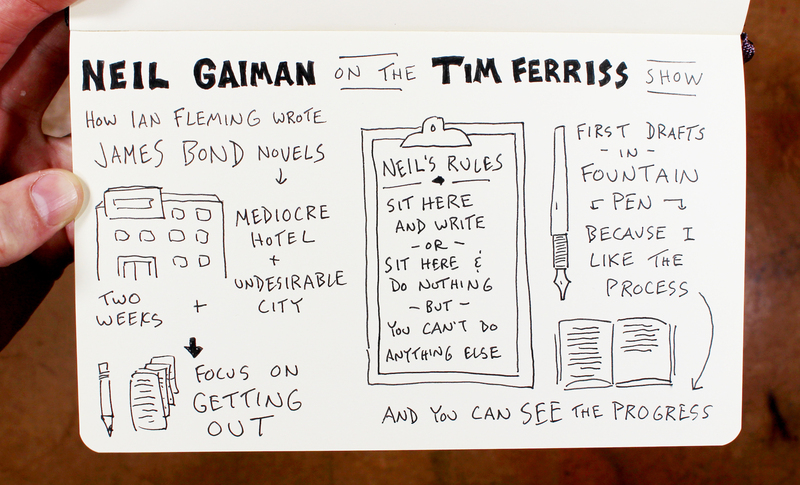 I recently listened to an interview between Neil Gaiman and Tim Ferriss in which Gaiman shares much of his writing process and preferred tools. I’ve captured some of the highlights from the conversation in the sketchnotes below. It was interesting to hear Gaiman talk first about Ian Fleming’s process for writing James Bond novels and then his own rules for writing. 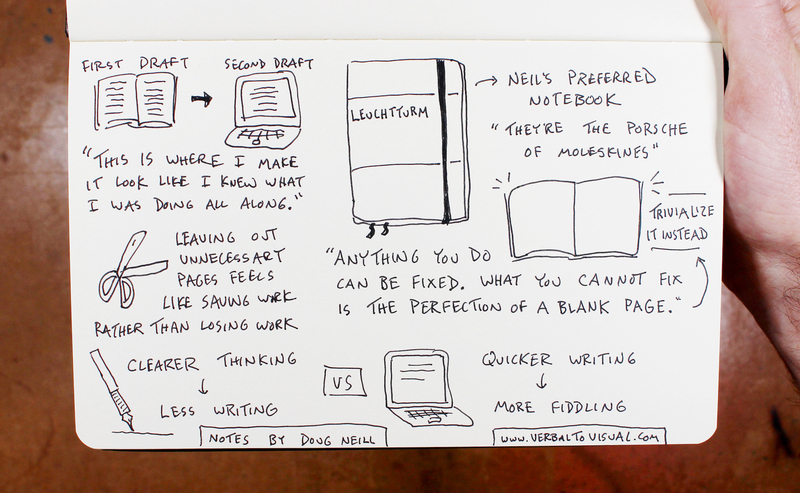 Neil Gaiman on his writing process. In Fleming’s case, it was about sequestering himself in a mediocre hotel in an undesirable city for about two weeks. That way he wouldn’t be distracted by luxury or sight-seeing and would instead focus on the writing so that he could finish it and then get the heck out of there. Gaiman has a simpler technique. When he sits down to write he simply gives himself two options: he can sit there and write or he can sit there and do nothing. But he can’t do anything else. It’s that permission to not write that is freeing, and eventually, after staring around for a bit, the act of writing becomes a whole lot more interesting and appealing than the act of doing nothing. In the case of tools (see Ferriss’s post for a full list of links), Gaiman prefers writing first drafts with a fountain pen in a physical notebook both because he likes how that process feels and because he can see the progress on the page in a more direct and tactile way compared to looking at a screen. The tools and the processes that support Gaiman’s work. Gaiman also shared how when writing by hand you spend just a bit more time thinking before you commit words to the page, and that clearer thinking leads to more precise writing compared to the process on a computer in which you’re able to get sentences down quicker but then are tempted to spend (and, arguably, waste) time fiddling with them. It’s in the second draft, as Gaiman transfers the text from page to screen, where he weaves together the strings laid down in the first draft. “This is where I make it look like I knew what I was doing all along,” he said. I’ve recently built writing into my daily routine. I want to write (and eventually publish) illustrated essays. I’m still in the early stages of identifying my own essay-writing process, so it was helpful to hear some of the specific strategies that came up in this conversation between Gaiman and Ferriss. The two that I’m most interesting in experimenting with: writing first drafts by hand (something that I used to do but haven’t lately), and experimenting with the setting in which I do my writing. 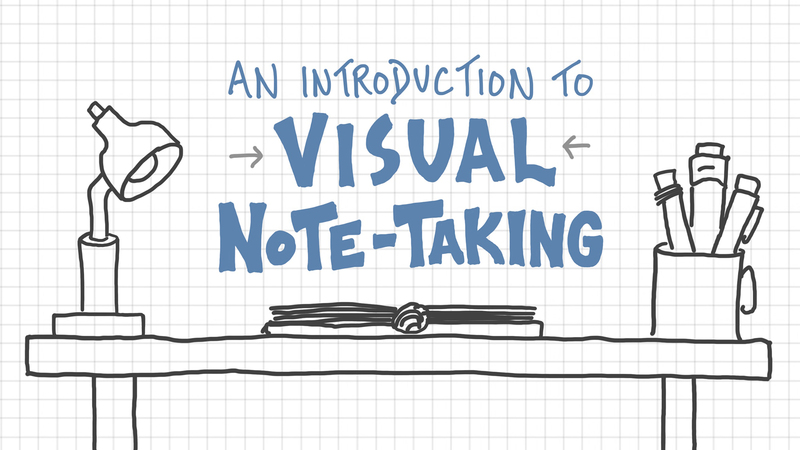 You can check out the show notes for that video in this post: The Brick Road Approach To Sketchnoting.